Office Spring Cleaning? You're Doing it Wrong. Office Spring Cleaning? You’re Doing it Wrong. Spring months bring warmer temperatures and sunnier days. Everyone wants to enjoy that clean, fresh feel indoors as well. No doubt your office is also ready to shed its winter coat with a good spring cleaning. Your workplace will sparkle and shine when you entrust the job to a qualified janitorial service. Are you thinking there’s no need to bring in outside help? After all, everyone knows how to clean, right? Your employees can all pitch in and get it done in no time. The reality is that there are several reasons, both financial and operational, why it makes sense to hire a service to handle your cleaning and janitorial needs. Each minute your employees spend on cleaning chores is a minute spent away from their actual work. In addition, their cleaning time will be constantly interrupted by phone calls and other necessities of doing business. People can’t give the proper focus to either job and they both suffer as a result. Hiring a janitorial service ends up being more cost-effective than paying overtime to make up for the lost hours spent on cleaning. It can also prevent the expense of having to redo projects because they weren’t done well the first time. You pay your employees to grow your business. Let them do their jobs and leave the cleaning to a dedicated service. Spring is a tough time for allergy sufferers. Those irritants end up in your office as your employees track them in on their shoes and clothing. It’s also a prime time to catch colds and other illnesses because the temperatures are neither hot enough nor cold enough to kill germs and bacteria. A janitorial staff can take the time to thoroughly remove dust and other particles from desks, cabinets and other areas where they accumulate. They’re also qualified to use the right procedures and cleaners to disinfect surfaces where germs are likely to be. You and your employees will breathe much easier when you have to spend less sick time away from the office. 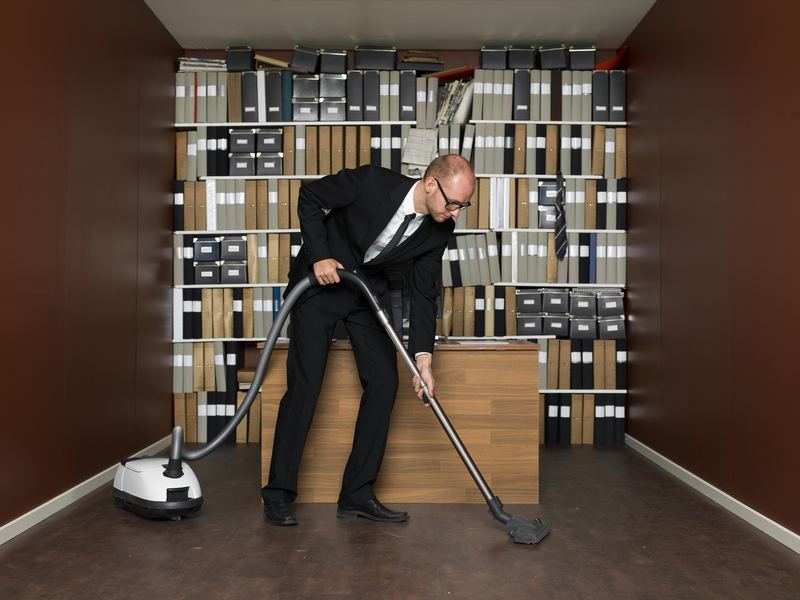 Outsourcing to a janitorial service means maintenance can take place after office hours. The job can be done more quickly and thoroughly when cleaners aren’t forced to work around your employees while they try to do their jobs. It also keeps your staff from being distracted as they shift around trying to accommodate members of the cleaning service. After-hours cleaning is a good safety measure as well. Employees don’t have to put up with the smell of the various chemicals. There’s also less chance of spills or other accidents when fewer people are around. 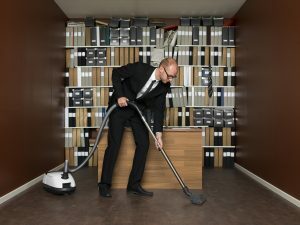 Maintaining a clean office is too important to leave up to the partial efforts of employees who are more productively occupied elsewhere. A dedicated janitorial service pays returns in reduced costs and greater efficiency. Contact us at Summit Janitorial for more information about the benefits we can provide to you and your company.